If a tool is not in good working condition, it’s no longer a tool. Edge-N-Knife offers local professional sharpening services for kitchen knives, serrated (wavy edge or bread) knives, pocket knives, hunting knives, garden tools, lawn mower blades, scissors, food processor blades and more. If you’re uncertain as to whether we’ll be able to sharpen your blade, contact us and we’ll be happy to let you know. Sharpening services typically have a three-day turn-around. Pricing is based on the length of the blade and any necessary repairs, for instance if the blade has a bent or broken tip or large nicks. Wavy-edge knives, also known as bread knives, have a different pricing structure as they require specialty sharpening. 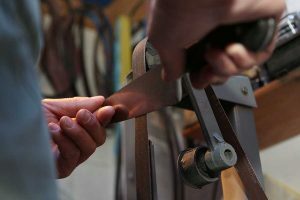 The flat side of a serrated or wavy edge knife should never be touched; sharpening only the bevel side at each serration is the correct procedure. The cost for sharpening services starts at $3.50 and depends upon the type of blade, as well as the condition of the knife. Edge-N-Knife stocks home sharpening systems and stones for most blades from pocket knives to chef and sushi knives. Our ceramic sharpening stones and steel files from Lansky, Messermeister and DMT will set you up for successful blade maintenance at home. How do you keep a knife sharp? 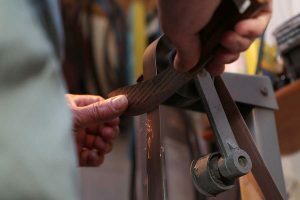 First, you need to know the proper angle to steel your knife (the term for sharpening on a steel rod), as well as how to maintain that angle. For example, the angle to maintain when using a steel to sharpen a typical kitchen knife is 20-22 degrees. Knife steeling only needs to be performed when the edge fails to perform as well as you need it to. Second, avoid using your knives for things other than what they are designed for. This may seem obvious, but don’t cut plants or plastic twist-ties with a kitchen knife. These actions will dull the blade, which is meant to pierce and slice through softer, organic materials. What is the most common way to dull a kitchen knife? Have you ever finished chopping your veggies and scraped them from the cutting board into the pan with the blade edge of your knife? Believe it or not, this is the most common way to dull a kitchen knife. Scraping food into the pan with the blade edge curls the edge, dulling it for cutting purposes. The best way to extend the life of your cooking is to scrape food into the pan with the back (non-blade edge) of the knife. Contact Edge-N-Knife for more information, or visit the store to take advantage of our sharpening services today.